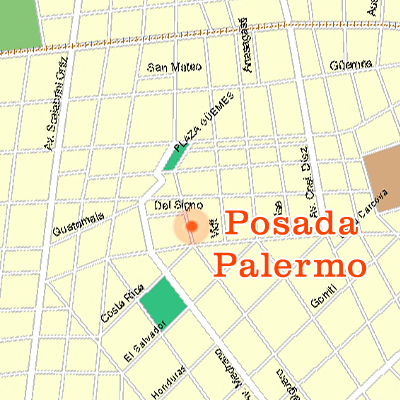 Posada Palermo is located in the heart of one of the most traditional and fashionable districts of the cosmopolitan Buenos Aires. 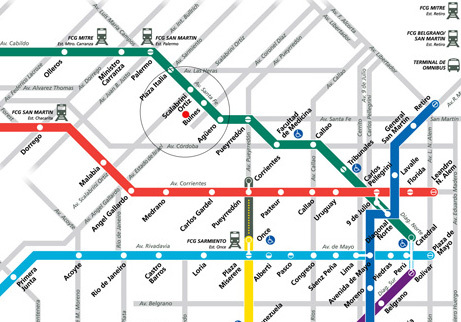 On Jerónimo Salguero St. - only 5 blocks of the subway station "Bulnes" of D Line (that will take you from "Catedral" Station to "Congreso de Tucuman" Station, 32 lines of buses (10, 12, 15, 29, 36, 37, 38, 39, 41, 55, 57, 59, 60, 68, 92, 93, 95, 106, 108, 109, 110, 11, 118, 128, 140, 141, 142, 152, 160, 161, 168 y 188.) - taxis, radiotaxis or remises. 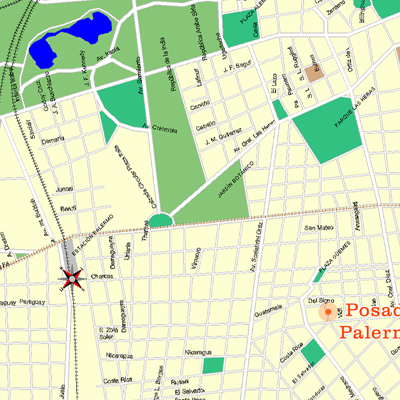 Posada Palermo offers the possibility of being close to everything. 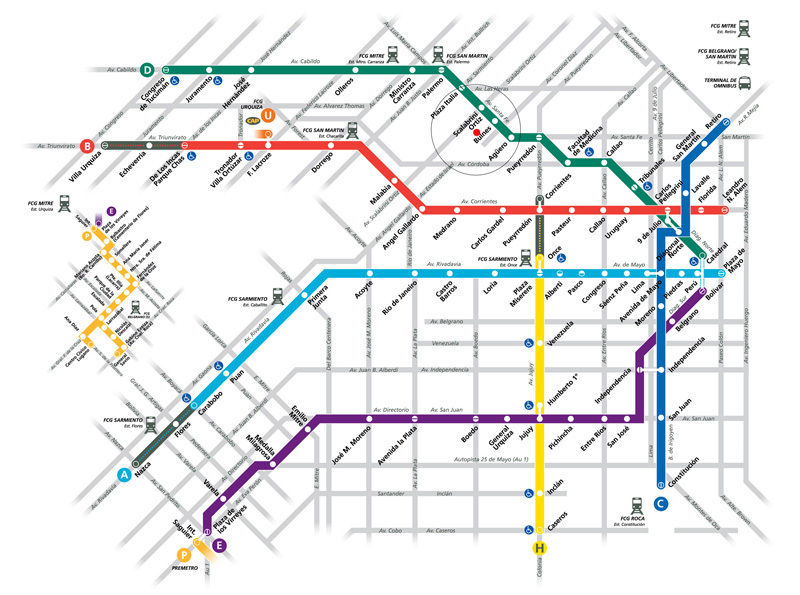 Click on the map to have see a bigger pic of Buenos Aires' network of Subways. The yellow point is our location. Metrovias website for more information about traveling in the Subways. It is also the district where, right now, you can find the hip of Buenos Aires: bars, restaurants, businesses whose architecture shows the new trends of design. Palermo is a district that's full of surprises, even for its neighbours: the guides of Palermo need a constant renewal. 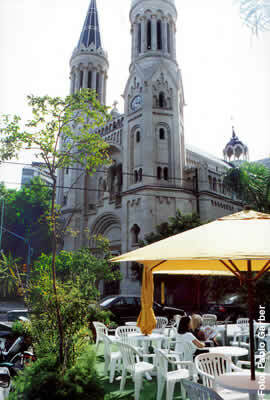 That's the reason behind all the names it has: Palermo Viejo, Palermo Hollywood, Palermo Soho. All suit it but no one describes the whole of it. Every day something new appears, without losing the charm of its traditional houses, usually recycled as houses for an urban population, demanding in its tastes and ready to show off the contrast of new and old. 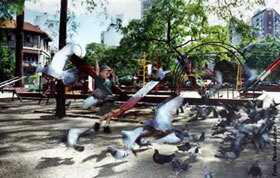 Plaza Güemes, half a block away from Posada Palermo, was one of the more related sites to old Palermo, which grew on the side of Maldonado stream and marked the city limits in those times. A limit which Borges called "the borders", meaning that beyond thaty limit you would find the countryside. District of "compadritos" and lady's men; the famous reiversiders"orilleros", card players and very good at using the knife -as police history has revealed; showing that, around here, cuts were rarely saved. In order for you to get an idea of the area, here's a piece of the history, the magic and the poetry which surrounds Posada Palermo. Originally, Palermo was a typically Italian neighborhood; beginning in 1880, a large number of immigrants came to Buenos Aires, entire neighborhoods were occupied by foreign communities, who maintained their traditions and culture. In Palermo's case, it was the Italians from Calabria who organized in religious groups, such as San Roque, which, starting in 1893 carried out Services at Plaza Guemes, as a group activity for mutual solidarity in a somewhat hostile environment. Word, that was in charge of the chapel started the construction of La Basilica del Espiritu Santo, one of buildings that define the area. Officially opened in 1907, it typical of the romantic style, which lacks outside ornamentation and whose walls give it a strong, solid aspect. On both sides, it has two towers with cone shaped tops. 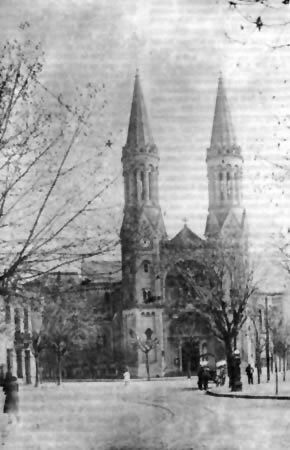 These towers were higher than any of the houses of the neighborhood at the time that they were built. In its interior, there is a preponderance of romantic style decorations and the materials used are mostly European. The columns are of black granite and come from Austria, the floor tile came from Germany and the stained glass was French. The design of the streets around this part of Palermo is somewhat irregular. Leaving the plaza, on Jeronimo Salguero street, almost across from our Bed and Breakfast, we'll find Pasaje del Signo, only one block long. The origin of the Pasajes is generally found in internal streets of the old properties of the region, which when divided in lots, became property on all and none. In the case of this particular street, it may have been an arm of a lagoon that once occupied the lots near the Plaza. A few meters away, the front of Posada Palermo, stands out as one of the last exponents in the area of an architectural style, typical of Buenos Aires, "la casa chorizo".